INDUSTRIAL PERFORMANCE - PREMIUM FEATURES - AFFORDABLE FACTORY DIRECT PRICE - Made in U.S.A.
$4,995.00 (table top version) - $5,530.00 with heavy-duty stand with full width shelf and locking casters. Let us build one for you, like we have done for thousands of other customers over the last 30 years! 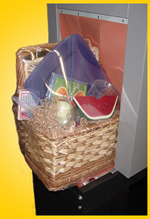 The PacWrap® Model 1520 Shrink Tunnel will beautifully shrink wrap a large products such as fruit or gift basket in 5 to 15 seconds! Permanently lubricated motors, blowers & fans provides you maintenance free performance. Designed for 24 hour continuous use. 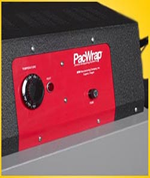 The PacWrap® Turbo-Aire™ shrink tunnel gives superior results with virtually any shrink film, yet operates on standard 120 volt power (220/240 volt 50/60Hz available) Fully insulated heat tunnel chamber for energy efficiency. Separate thermostats for the heat tunnel chamber and the variable speed conveyor belt assures complete heat coverage for fast, uniform shrinkage with recirculated heated air - the most energy efficient shink tunnel in this size category. Isolated Electronics: All electrical components on the PacWrap® Model 1520 Shrink Tunnel are located away from the tunnel chamber for safety, and long life. Perfect for shrink bands, shrink sleeves, shrink tubing and shrink films. The Automatic Cool-Down cycle after use saves time and money for years to come! How? 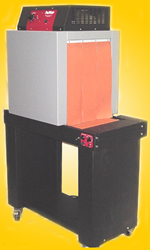 By eliminating the need to turn off the heat tunnel chamber and belt heaters prior to turning off the system. With automatic cooling, you simply set the heat and speed settings to provide the perfect shrink, then and leave them set. When you're finished shrinking, leave the heat and conveyor settings as you liked them and simply turn-off the main power switch. The heaters then shut-down while the motor, blowers and fans continue to run until a safe stopping temperature is achieved. (About 10 minutes). Then the tunnel safely and automatically shuts itself completely off. No more paying someone to stand around and "watch" while the tunnel cools down before finally turning off the power. The automatic cooling cycle greatly extends the life of the motors, blowers and fans while eliminating the daily setup of correct temperatures and conveyor speeds, a feature found on shrink tunnels costing thousands of dollars more! The PacWrap® 1520 Shrink Tunnel with its huge 20" high by 15" wide heat shrink tunnel chamber opening is the answer for fast and efficient shrinking of shrink wrap film over Gift Baskets and or other high profile packages! And the side ducted airflows can be user adjusted so the 1520 can be used for low profile packages such as CD's or DVD's as well! The 1520 is as versitile as it is energy efficient. So whether you need to shrink wrap fruit and gift baskets, or shrink a tamper-evident shrink band on the top of a tall container, the Model 1520 will do the job. 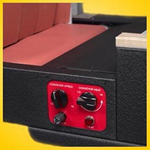 Built for continuous use - at an affordable price - works with virtually any standard shrink film, shrink bag, or shink band, the PacWrap® 1520 Shrink Tunnel is the easy answer for your high profile package shrink wrapping needs. Overall Dimensions 35.5" Long x 21" Wide x 61.5" High-overall height with optional $535.00 heavy-duty stand with full length shelf and locking casters. 220/240 volt electrical components increases speed with 3.5kw heaters, 220/240 volt blowers, motors and fans. Also available is a 24 inch long roller take away conveyor, solid state PID loop temperature controller (+/- 2 degree temperature control) instead of the standard thermostat, and we build custom extended tunnel chamber length and widths up to 24 inches wide by 30 inches high. Regardless of your requirements, we can provide it. And help you too! © 2003 - 2019 ATW Manufacturing Company, Inc.
High Performance Fully Insulated Tunnel Chamber 20" High 15" Wide! No Need to Ever Reset Controls! Built to run 24 hours a day!